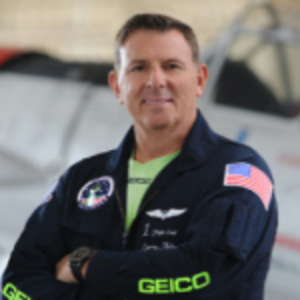 Larry Arken is the commanding officer and flight lead for the GEICO Skytypers. He also is a captain for a major commercial airline. As an adolescent and aspiring aviator, Larry sat in the co-pilot seat flying over the skies of Long Island and the northeast coast with his father, Mort Arken. Mort was a former naval aviator whose passion for flying led him to establish the Skytypers as an innovative advertising company typing large dot-matrix style messages near highly attended events and major metropolitan areas. Under Mort, the team also began flying at select air shows. At a young age, Larry saw the potential to build upon the foundation laid by his father to create the world-class organization it has become today. Larry’s aviation career formed while flying a variety of warbirds and corporate jets. He first flew Falcon 10’s, 20’s and 50’s. He then transitioned to flying DC-8’s for UPS. He later secured a position with a major commercial airline and has been a caption for 18 years. When not flying large passenger planes, he flies vintage P-47, F4U and P-51 warbirds for the Air Power Museum in Farmingdale, NY. Larry also holds a NATA North American Trainer Association designation and is a check pilot for formation flying. As an airline transport pilot, Arken has logged more than 25,000 flight hours and holds certification ratings for seven large jets. Larry has bachelor’s degrees in marketing from St. John’s University and in business from Thomas Edison State University. On days we fly, I look at flight conditions and then focus to complete the tactical maneuvers required. Typically, what are you doing at? 10:00 AM – Prioritize what needs to be addressed for the airplanes, schedule of events/flights, maintenance, etc. Main Street Grill, Northport, NY; if I can find the time.